Christmas markets date from the Middle Ages in German-speaking European countries, with Vienna’s December market first held in 1294. Although the earliest known market taking place at that time of year, it wasn’t a true Christmas-themed market. 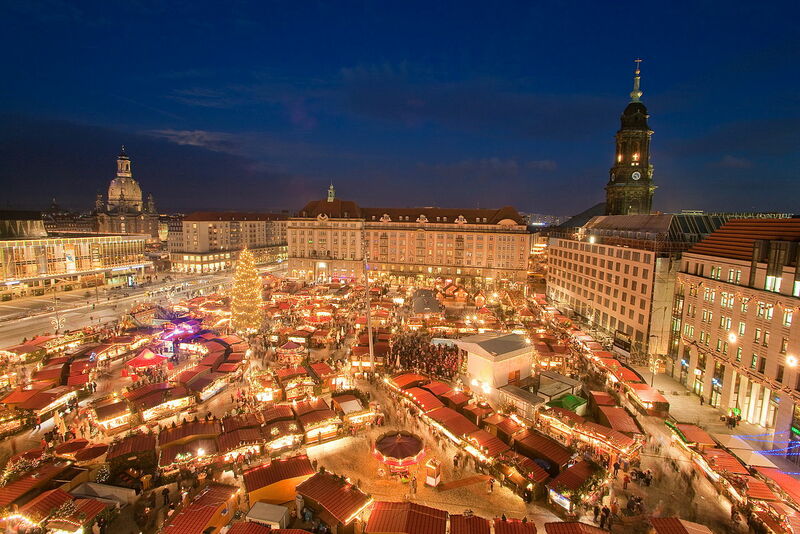 Munich’s market began in 1310 and is believed to be the first proper Christmas market. So how did it reach the UK? It all began in Birmingham in 1997 when Kurt Stroscher, Frankfurt City Council’s director of festivals and events, came up with the idea as a way to market his home city overseas. In 1997, Victoria Square became the site of the very first of the UK’s now famous Frankfurt markets, with a cluster of just 10 stalls. It was intended as a one-off event but has become an annual fixture. The following year Kurt took his idea to Bristol and then Manchester, which has been hosting the annual market ever since. In Birmingham, the Frankfurt market returned in 2001 and has been coming back every year since, with the council adding a Christmas Craft Market selling locally-produced goods in neighbouring Chamberlain Square and Centenary Square. Also known as Christkindlmarkt, Marché de Noël, Christkindlesmarkt, Christkindlmarket, and Weihnachtsmarkt – which will you be visiting this year? Take a look at our list below to find out more about your nearest Christkindlmarkt. Each winter Birmingham city centre comes alive with the arrival of the German Market, a clear sign Christmas is just around the corner. With great food, warming drinks, traditional gifts and live music, the Frankfurt Christmas Market attracts visitors from across the city and the UK. The market has run for over 15 years and is the centrepiece of the city’s Christmas events. This year for the first time, the market will run from Thursday, November 15 to Sunday, December 23. This award-winning Christmas market is one of the largest in the UK. For five magical weeks, it winds its way through some of Manchester’s most eye-catching streets and squares. Manchester’s award-winning Christmas Markets returns this winter offering mouth-watering international food, drinks and delicately crafted Yuletide gifts in the heart of this buzzing city. With nearly 350 beautifully festooned stalls and chalets spanning 10 distinctive market sites across the city centre, the Christmas Markets are free and accessible to all. Liverpool Christmas Ice Festival launches on November 16 and runs through til December 23, Christmas eve split between St George’s Plateau and Pier Head. There will be a super-sized triple-lane ice slide, larger ice rink, giant ferris wheel and 50 traditional German market stalls creating Liverpool ’s biggest Christmas market. The unmissable Liverpool Christmas Ice Festival experience continues at the Ice Bar which features a sub-zero room of crystal clear ice sculptures where even the bar, tables and chairs are carved from real ice. There will be two Christmas markets in Glasgow this year at St Enoch Square and George Square. The main festive market will be operating every day from 9th November to 23rd December. As well as a gourmets delight, customers can while away an hour or two at the wonderful Gluhwein House operated by Markus Kochems from the Mosel valley. Kochems are listed in the top 100 wine producers in the World. As well as the Gluhwein you can also sample some of Bavaria’s favourite beers at the Bavarian bar. Get into the festive spirit as Hyde Park’s Winter Wonderland returns to London for the 12th year. This free-to-enter family event includes a host of Christmas-themed fun and activities, including Winter Wonderland ice skating, big top shows, an observation wheel and a huge Christmas market. Over 200 charming Bavarian-style wooden chalets will tempt you with unique gifts, traditional Christmas decorations and culinary delights. Take some time out from the excitement of the attractions for a leisurely stroll around the Christmas Markets, open 10 am to 10 pm. This season, the Southbank Centre Winter Market is pulling out all the stops to throw their biggest and best ever Christmas celebration (running from Friday, November 9 to December 27). There’s a sack-load of Thames-side festive fun planned including one of the best Christmas markets in London, where shoppers can bag gifts, festive produce and sweet treats, and seasonal Christmas shows, guaranteed to brighten up any miserable family members shunning the festive spirit. You’ll find plenty more than baubles and gingerbread to tempt you in the wooden chalets that will make up the Southbank Centre Christmas Market this year. Stock up on festive food and tipples, unique gifts, stocking fillers and treats. Belfast Christmas Market will be returning to the grounds of the Belfast City Hall (Donegall Square) for the 14th year for the much anticipated and highly popular Belfast Christmas Market! Opening from 17th November to 22nd December, the gates will be open every day for visitors to explore a number of countries from across the world including Germany, Spain, France, Italy and a number of local traders. Santa will be visiting the market to meet families as there will be plenty of entertainment during our visit. One of Belfast landmark buildings, the famous City Hall with its beautiful gardens, provides a wonderful backdrop for the Belfast Christmas Market, situated right in the heart of the City Centre and its wider retail shopping areas. The Market is situated directly alongside the central Bus link and taxi station so transport and travel are never far away. These fabulous City Hall gardens are transformed into a bustling Continental village providing a great shop around Europe opportunity in the heart of this famous City Centre. The Belfast Christmas Market also guarantees a real Irish welcome for all its visitors. During the period of Christmas and Advent, Dublin is home to some interesting Christmas markets, among the most famous and popular the new St. Stephen’s Green Christmas Market. If you are looking for a unique way to celebrate the festive season in Dublin then look no further than Aprés Ski pop up bar at I BELIEVE. Après Ski Scandinavian lodge provides the perfect location for an aperitif, corporate functions, or as the perfect party starter for you and your friends this festive season. With a panoramic view of the I BELIEVE™ Christmas market, fresh pine trees, fairy lights, hot cider and sheepskin blankets there’s no better way to celebrate the festive season than at Dublin’s only unique ski lodge and Christmas party venue! The Christmas Market takes place between 16 November and 16 December at Grey’s Monument, Grey Street and Grainger Street. The Christmas Market welcomes stall holders from closer to home. There are beers from local microbreweries, home-made jams, delicious cakes and handmade chocolates. And once you’ve bought something scrumptious to eat, you can find special gifts such as scarves, leather bags, hand thrown pottery, woolly hats and jewellery. Newcastle Market Place are also thrilled to offer local primary schools the opportunity to take part in our FREE Educational Tours! These allow for young children to visit the market with their teachers to meet the traders, learn about all the different cultures being represented at the market and to try some tasty foods at the festive market! Looking for a truly fantastic festive shopping experience? Look no further than the award-winning, beautiful Bath Christmas Market. Each year the centre of Bath is transformed into a magical Christmas shopper’s paradise, as over 170 chalets packed full of gorgeous Christmas gifts line the streets surrounding the Roman Baths and Bath Abbey. Soak up the sights, smells and sounds as you wander around the market; we guarantee the aroma of warming mulled wine and freshly baked mince pies, enjoyed with a generous sprinkling of cheering carols will get even the biggest of humbugs into the Christmas spirit! Look out for this year’s animated light display which will be bringing the market to life in the shadow of Bath Abbey. The choice is getting bigger every year. European and local producers offer everything from fine amber jewellery, handcrafted leather bags and top-quality bonsai trees, to handmade Belgian kitchenware, framed photo prints and French soaps. And of course, bringing a great splash of colour is the Dutch Bulb and Plant Garden selling a fabulous array of bulbs, trees, shrubs, garden ornaments and bird feeders. Christmas decorations, clothing, accessories, jams and marmalades, jewellery, glass-blowing, homeware, garden goods, children’s wear, personalised gifts including pictures, clocks and pillowcases. When planning your visit, don’t miss the amazing array of food and drink! Christmas Markets are famous for traditional bratwurst but you can also treat yourself to Hungarian goulash, Spanish paella or a good old-fashioned hog roast. Plenty of vegetarian options will be on offer, and for those with a sweet tooth, the choices are even more mouth-watering, such as Dutch mini pancakes or French profiteroles! Relax with a hot chocolate, German or Spanish beer, or French wine. Visitors to Belfast’s Christmas Market will be able to avail of the now infamous culinary delights including a range of products such as cheeses, olives, Italian nougat, Belgian chocolates, French tarts, (made on site by a fantastic Breton Patisserie) Mouthwatering foods will be available for customers to sample and buy as they wander around the Yuletide market – giant Bratwurst sold from a traditional Schwenkgrille, Spanish Paella, exotic and rare meats from around the World such as Alligator, Impala, Kangaroo and Wild Boar. For those who enjoy Crepes one of the best Creperies in Europe will be selling both the sweet crepes and savoury Galettes alternatively the Dutch equivalent, the Pofitjes (or mini pancakes) will be served with a variety of toppings. There is usually Pick ‘n’ Mix stalls full of traditional sweeties and fudges there, plus stalls selling huge helpings of local dishes such as scouse and hotpot to warm up wintery shoppers. Bratwurst from Green Park Brasserie, steak and chicken ciabatta from The Herd, Pieminister pies and Orchard Pig ciders. Gascoyne Place served up Tartiflette, there were scrumptious chocolate waffles from The Bath Waffle Co, pulled pork courtesy of The Great Stone Baker and a selection of caramel nuts, warm chestnuts and mulled wine available from Chou Chou Nuts Over You. How to get there: Now comes the easy part. Getting there. Simply find your local Easirent branch, choose a car large enough to fit you, your friends and all your shopping in – and pay next to nothing if you book in advance! Go to www.easirent.com to find your dates and select your hire vehicle. Nothing to pay until confirmation now’s the time to start planning the perfect Christmas Market Day Out.